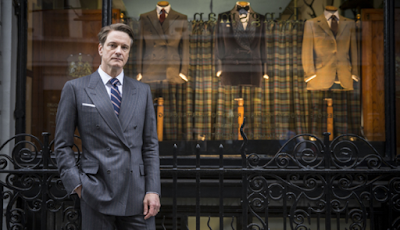 Shedding his typecast image of slightly dull romantic lead, Mr Firth plays suave spy, Harry Hart (no relation to Tony). 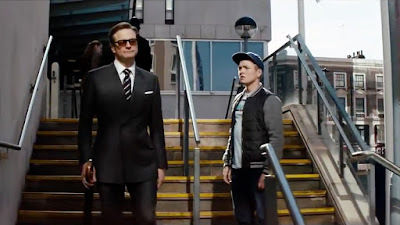 The archetypal English gentleman, Harry Hart takes Gary ‘Eggsy’ Unwin under his wing in a colourful, gadget-laden film that is positively dripping with style, gratuitous violence and one-liners. “Manners...Maketh...Man. Do you know what that means? Then let me teach you a lesson”, which he says just before giving a pub full of wrongdoers a jolly good hiding. 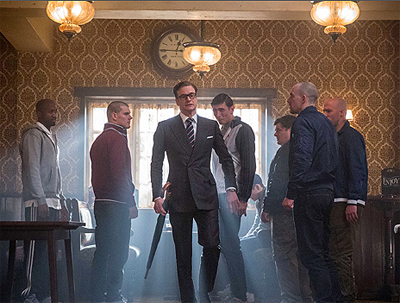 The secret-spy organisation, Kingsman, is hidden in the depths of a Savile Row tailors of the same name. 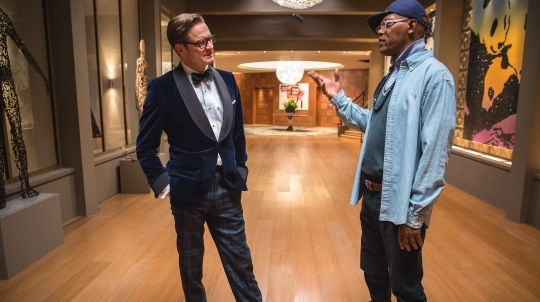 Given the location of the Kingsman headquarters, the secret agents are a stylish bunch. They adopt code names from Arthurian legend so Firth/Hart is Galahad, Jack Davenport is Lancelot and Michael Caine is Arthur. 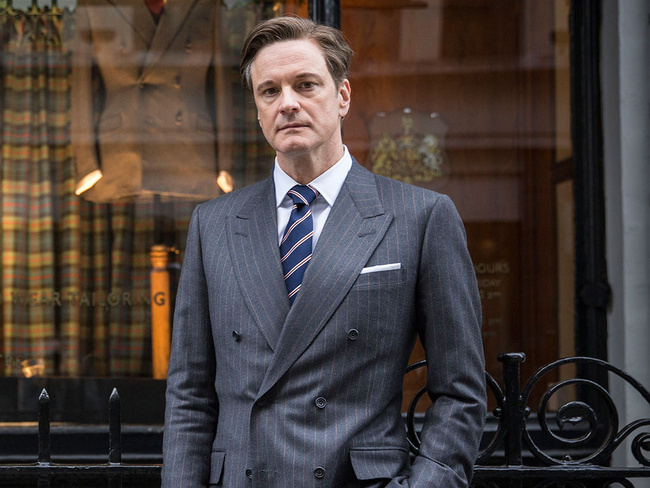 Harry Hart’s signature style is double-breasted suit (6x2 button arrangement in either charcoal, navy and grey), white shirt and pocket square, black Oxford shoes and a suitable tie (stripes and polka dots both feature). We also see Hart when he goes for dinner to the lair of evil super-villain Richmond Valentine (played with a lisp by Samuel L Jackson). His ensemble here includes an exquisite midnight blue dinner jacket, plaid trousers and bow tie. When Hart is recovering after an altercation with Luke Skywalker (yes, really), we get to admire his cream pyjamas with dark piping, wine-coloured dressing gown and velvet slippers. As he gets embroiled in a number of skirmishes, Hart’s bespoke suits certainly hold up well. The twin rear vents are a must and his trusty brolly is always to hand. His Kingman superior, Arthur is equally well attired. 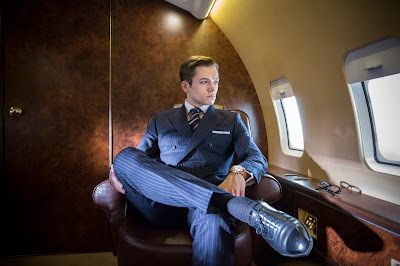 I was positively drooling at the sight of his windowpane suit. Rather cleverly, Kingsman director Matthew Vaughn had the foresight to realise that lot’s of people are heavily influenced by what they see in a film. So he teamed up with MR PORTER for a Kingsman collection of clothing and accessories, with the likes of Turnbull & Asser and Lock & Co taking part. By all accounts, the collection has been selling like hot cakes. Very expensive hot cakes, of course. 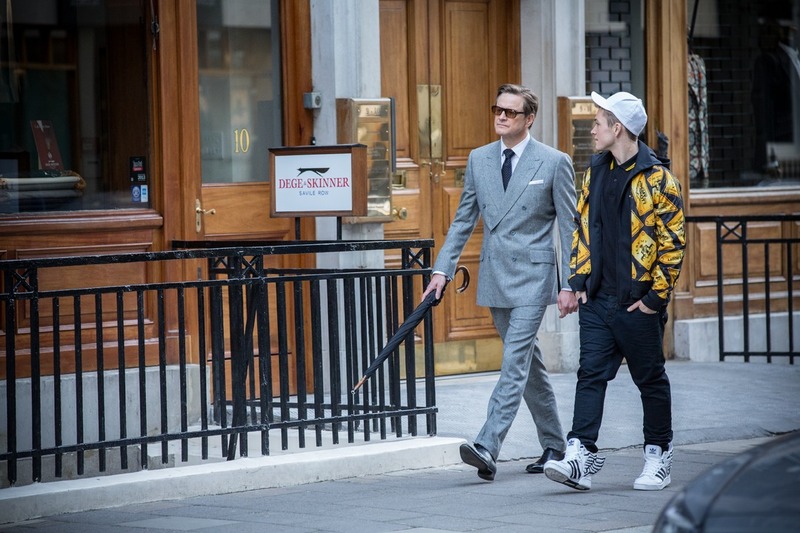 Even 'Eggsy' found himself ditching the leisurewear for something more sophisticated. I’m looking forward enormously to the planned sequel. 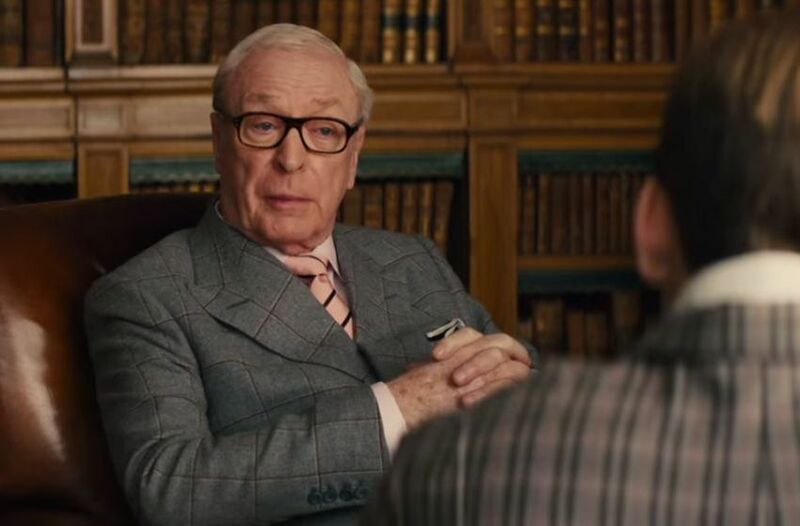 It should have been Bill Nighy not Colin Firth. But then again, it would have been nothing but blue suits. I do love Bill Nighy! Perhaps he will appear in the sequel. I imagine David Bowie would make a first class Kingsman too. I have to say, I never saw the appeal of Colin Firth until I saw this film, but he's extremely dashing in it. I was also very happy to see Jack Davenport, who's been a favourite of mine since Ultraviolet and This Life in the 1990s. Harry Hart definitely owes a sartorial debt to John Steed. Ah yes, I used to enjoy This Life. I was also rather fond of Coupling. It was a great pity that Jack Davenport had such a small role but he excelled in the few moments on screen. 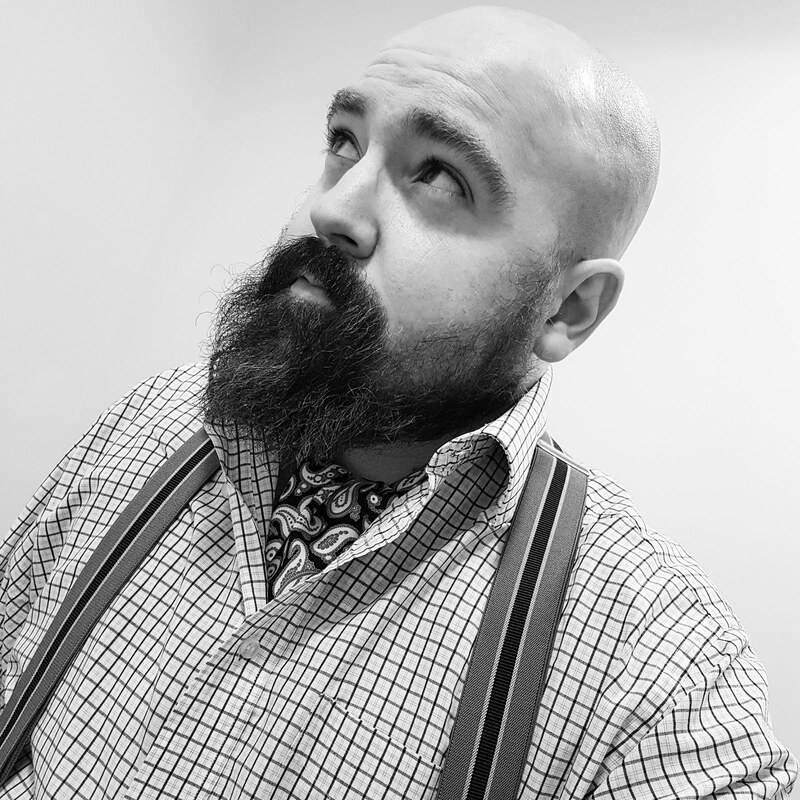 He looked rather fetching in his tweed suit, green tie and red pocket square. Mr Phipps thinks the very precise - yet louche, Mr Brian Sewell would be quite topping. He would need no kung-fu moves - instead, relying on the cutting remark and withering look. I would also commend Mr Charlie Watts. Mr David Bowie is a great suggestion - but Dr John Cooper Clarke would be better - shame about the late Mr Lee Brilleaux who had that combination of dapper + hard-as-nails like no other. I'm glad you enjoyed the film. On the subject of Bowie, he's rather good in The Prestige. 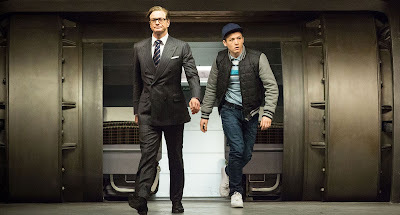 Thanks awfully for the Kingsman recommendation, Sir!